Well I must say I had enough with trying to find the English equivalent to this Bean, that's so common. Infact I was on the verge of giving up on this post. Not only was I confused, I confused Amma also. I spent a long distance call on trying to find the exact name of this. I was very particular that I was clear on which bean I was referring too. We finally hit the right one. Since I went to the extreme point of goggling this, I might as well list out all the names for posterity...This goes by the botanical name Dolichos lablab L (I have to confess I felt so stupid that this was that), English - Hyacinth bean, Hindi - Bhaja vasu, Telugu - Anumulu, Tamil - Avarai, Kannada - Anvare. Phew!...so many names and yet we feel we know all of them. Coming to the dish, this falls under the "the most wanted dish" at my place. I first had it in one of our family friends place. The dear Aunty was one of those types, who cooks things in a jiffy but never appears to have even extended her hand otherwise. Memories of that fine day when I had tasted this, is still faintly lingering somewhere...still its good enough that I always relate to that. Amma has, since prepared it many times for me to even count how many times. I guess I am giving too much of a build up, if you understand the slang, for this simple bean which gets stripped down, sorry peeled out to be cooked unfortunately in a gravy. We get the fresh ones only during a season. So during the entire season, its only Pithikina pappu kura at home. Pithikina means "pressed out" in telugu. We soak the bean seeds overnight or for some 6 hrs, then remove the skin and use the inner seeds for this gravy. 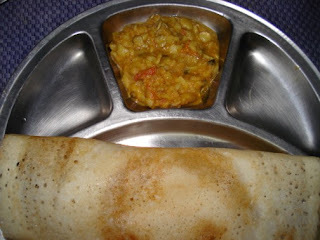 This is an ultimate combi with Dosa. Well before I just go on and on...lets get on the fancies of this humble yet delicious bean. Coriander leaves and mustard seeds for seasoning. Chop Onion, tomatoes to fine pieces. Make a paste of fennel seeds with coconut. Heat oil in a cooker, add seasoning, then sauté onions till brown, add tomatoes with salt. Cook till its soft. Then add chilli powder, coriander pw and turmeric pw. Cook well. Then add in the peeled beans and fry well. After 5 mins, add coconut paste and water. Cover with lid and pressure for 1 to 2 whistles or till its cooked. I normally use potatoes if I want to make extra gravy. Normally pressure cook both potatoes and the beans. Else you can chop into cubes and fry with onions. Finally garnish with chopped coriander leaves. 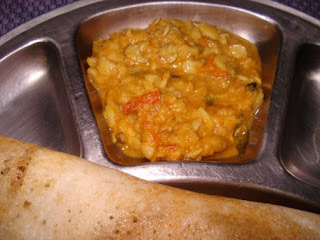 This goes excellently with dosas.